The annual April meeting of the County Commissioners to make application for transfers of taxable property was held last week.— There was a very large attendance of our taxpayers each day and much business was transacted. A most noticeable feature of all that occurred was the manifest indifference of owners as to their slave property. Some would doubtless have preferred turning lose their slaves, to paying tax upon even the low value at which they were assessed. 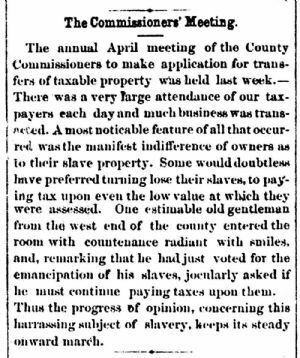 One estimable old gentleman from the west end of the comity entered the room with countenance radiant with smiles, and, remarking that he had just voted for the emancipation of his slaves, jocularly asked if he must continue paying taxes upon them. Thus the progress of opinion, concerning this harrassing subject of slavery, keeps its steady onward march.